Well, we have been here for five days and are getting settled and adjusting to the heat and humidity. So far, we are here with Cassie, a young lady here for two months to teach English. It is very quiet, but it is a great opportunity to reacquaint ourselves with the staff and practice the language. It is pleasantly surprising how many words and phrases are coming back! 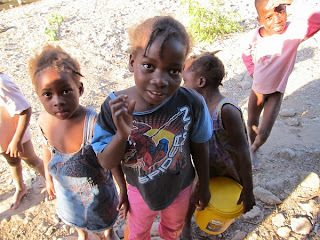 There are many good things happening at Haiti ARISE. The church is going as strong as ever with Sunday service, Tuesday service, Thursday Prayer time. On the other days, there are Bible studies for women, men and youth. Once a month the boy's club and the girl's club meet. The medical clinic is running smoothly - operating three days per week. It is fully staffed by Haitians. There is one doctor, one male nurse, one pharmacist and a young man in reception. The Technical school, which many teams have worked on over the last 2 1/2 years is now offering a few classes. There are over 200 students registered and there are classes six days every week. Some of the classrooms are used for Sunday School, so it is used all seven days per week! That's the way to use space! The classes being offered now are carpentry, plumbing, computers, electrical, tiling, and English. They are mostly taught be teachers from Petit Goave who found themselves out of work after the earthquake destroyed so many schools. They are thankful to be teaching once again. There will be other classes offered later and the Bible school will meet in that building, but the classes have not yet begun for the fall session. People will start arriving later in the week -- so Cassie, Wade & I will have company here in the 'big' house.